As a housewarming gift fruit baskets and gourmet food baskets are an excellent gift choice and will provide the family with a bit of healthy food while the cupboards are still being stocked. A fruit gift basket also makes a wonderful real estate closing gift or to welcome a new neighbor. Buying a new home is one of the biggest steps a family or individual will ever take. An excellent way to celebrate their real estate purchase with style is to send or deliver a new home gift basket by Adorable Gift Baskets. A new home gift basket displays your thoughtfulness as you help them celebrate moving into their long-awaited dream home. Our lovely housewarming gift baskets create a sense of excitement with a few of the fanciful items a new homeowner needs or wants. Some of the favorites they'll find within our baskets include tasty gourmet foods, heartwarming chicken noodle soup mix, chili mix, crunchy crackers or pretzels, creamy cheeses, decadent chocolates, freshly-baked cookies, smoked salmon, and other mouth-watering snacks. 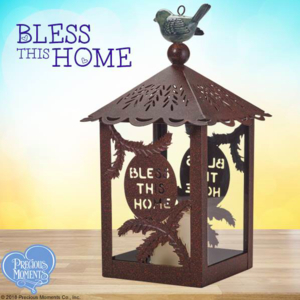 Welcome them to their new residence with a new home gift basket containing a few beautiful home decor accessories, a home project organizer, and more. At Adorable Gift Baskets, you can choose from a number of specialty new home gift baskets such as our Housewarming Welcome Wagon with fresh goodies packed in a welcome wooden truck along with a gift book about the joys of home. 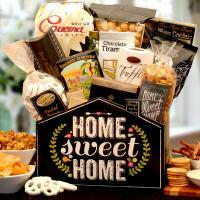 Our Home Sweet Home gift is perfect to present to your real estate clients at closing. It's a beautiful house-shaped gift basket with gourmet munchies inside such as cookies, wheat crackers, white cheddar popcorn, cheese, tea, etc. For the recipient who loves to grill out, try our Grill Master new home gift basket that has all the necessities for a successful first barbecue in their new home. 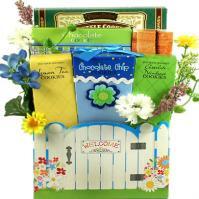 Or if they plan to do a lot of gardening after moving in, try one of our practical garden-themed new home gift baskets. At Adorable Gift Baskets, you can choose from many themes, foods and basket decorations to fit their needs as well as your budget. 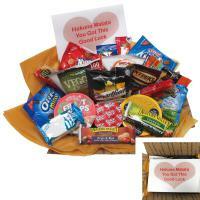 We also offer creative fruit gift baskets, organic baskets, sports-themed baskets, and relaxing spa gifts. New home gift baskets by Adorable Gift Baskets provide an affordable gift idea for housewarming parties, real estate closings, or to congratulate a new homeowner from a distance. Check out our new home gift basket selection today, and find that special gift to make their moving experience an occasion to remember! Real Estate New Home Gift Ideas, Unique Housewarming Gift Baskets and Gifts Perfect for New Home, New Apartment, Condo and Real Estate Closing Gifts. 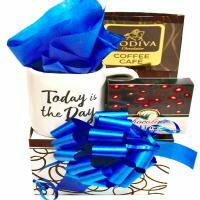 Realtor gift ideas, sales and housewarming basket gifts to support, enhance and promote your real estate business. 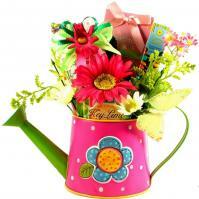 House Warming, New Apartment, Condo and Real Estate Closing Gift Ideas. Adorable Gift Baskets offers thoughtful house warming gifts for first time home owners, new apartment residents, real estate closings and housewarming parties. Our unique new home gifts are perfect for saying "Welcome Home" to new residents.